For the bounty hunters of the Star Wars galaxy, life is hard and brutal. Their lives are constantly in danger, hunting down dangerous criminals or outlaws and delivering them, dead or alive, in exchange for the reward. Only the most deadly and ruthless bounty hunters can survive this life—everyone else just ends up dead. 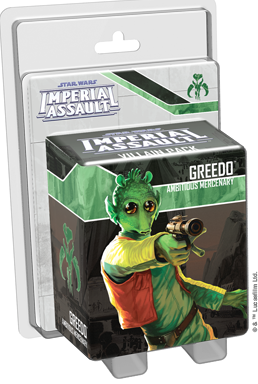 Still, every mercenary commander knows that there’s a special place for disposable bodies in your team, and you receive just that with the Greedo Villain Pack for Imperial Assault. 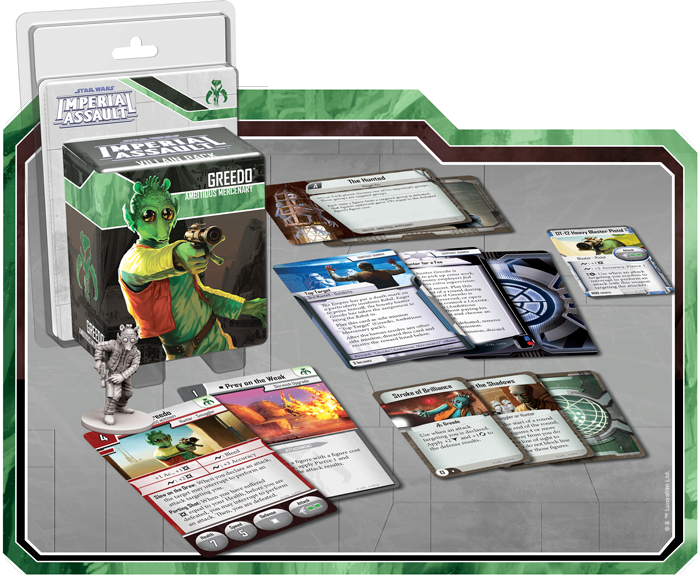 Within this expansion, you’ll find everything you need to bring Greedo into your games of Imperial Assault. A beautifully sculpted plastic figure captures Greedo drawing his blaster, while plenty of new Deployment cards, Agenda cards, and Command cards give you new tools to take advantage of, whether you’re playing a campaign or a skirmish. Today, we’ll take a closer look at the benefits you can gain from including Greedo in your strike team with the Greedo Villain Pack! 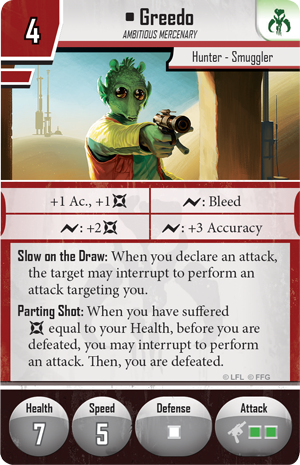 Whether you’re taking control of Greedo in a campaign or a skirmish, the first thing you’re likely to notice is his deployment cost: only four points. For a unique figure to cost just four points, you’d expect it to have some kind of drawback. 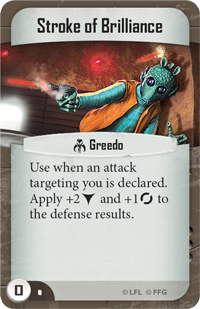 For Greedo, that drawback is the Slow on the Draw ability—whenever you declare an attack, your target can interrupt your turn and perform an attack against you! Obviously, this can be a significant drawback, but it’s easy to mitigate if you choose your marks wisely and make ranged attacks against melee figures. What’s more, with seven health, Greedo is hard to kill in a single attack. The only question is whether he packs enough of a punch to merit a spot on your team. For only four points, Greedo brings a fantastic amount of power with his surge abilities. He rolls two green dice and receives bonus accuracy and damage for every attack, without even spending surges. Then, he can spend his surges to inflict the Bleeding condition, deal more damage, or drastically increase his accuracy. With such powerful surge abilities, it’s obvious that Greedo can deal out some damage before he goes down. Even when Greedo is finally defeated, he still gets one last strike against your enemies. 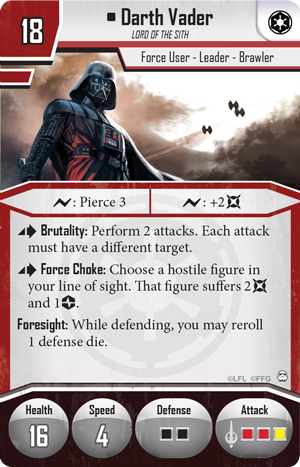 With Parting Shot, Greedo can interrupt to perform an attack of his own before he’s defeated, taking a shot at any figure of his choice and potentially buying you that last attack you needed to finish off your foe. Ultimately, Greedo will commonly be your first casualty, but for only four points, it’s easy to get more than enough value to outweigh the cost. When you’re playing a campaign game of Imperial Assault, Greedo is hardly an awe-inspiring villain like Darth Vader or The Grand Inquisitor. Still, he can prove effective in slowing the heroes down before he’s defeated. If you’re able to bloody a hero or force them to spend actions resting instead of working towards their goal, Greedo still fulfills his contract. 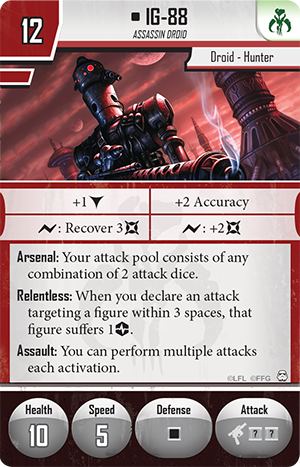 The Greedo Villain Pack also offers a new three-card Agenda set, Contract Gunmen, that you can use to gain the advantage as the Imperial player in an Imperial Assault campaign. For instance, you may play Stealth Squad to keep your figures hidden until it’s too late. When you deploy a group during any mission, you can play Stealth Squad to prevent figures from attacking you at long range. By forcing your enemies to engage you at close range, more expendable fighters like Greedo have significantly better odds of surviving past the first turns. 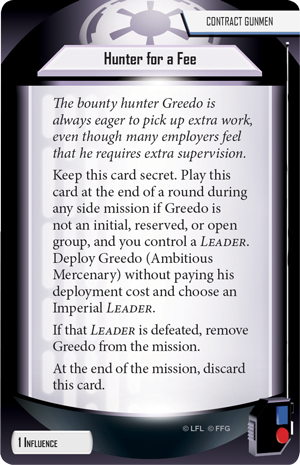 Alternatively, you could bring Greedo into any one of your missions by playing Hunter for a Fee. During a side mission where Greedo would not normally be included, you can play Hunter for a Fee and choose one of your Imperial Leader figures. Then, you immediately place Greedo in the mission without paying his deployment cost—he’ll fight by your side until he or your chosen Leader is defeated. Greedo can be an even more significant asset during a skirmish game. Whether you’re conducting illicit operations in a crowded cantina or breaking into a junkyard firefight, Greedo can cause more than enough damage to justify the expenditure of a mere four points. Even setting aside Greedo temporarily, the other cards in this figure pack can help your skirmish team, whether you’re playing with Greedo or not. A new skirmish upgrade introduced in this Villain Pack could prove very interesting to players focusing on Hunter figures. 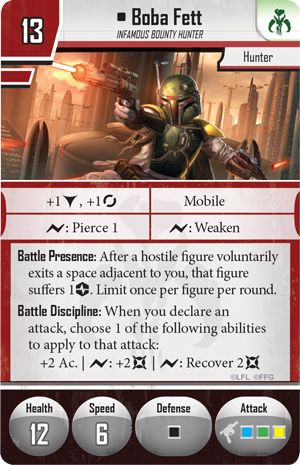 This skirmish upgrade is Prey on the Weak —while the attached Hunter is attacking an enemy with a lower figure cost, your attacks gain increased accuracy and Pierce 1, making this a potentially revolutionary attachment for high-cost units like Boba Fett and IG-88. helping you take down one of your opponent’s most dangerous figures. 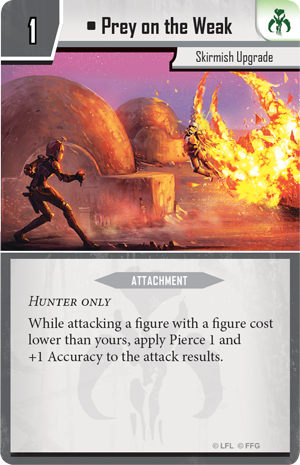 Alternatively, a couple of other new Command cards give you ways to increase Greedo’s survivability, even as his attacks whittle down your opponent’s forces. 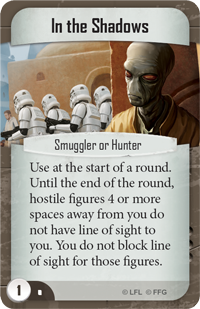 In the Shadows, like Stealth Squad, prevents a Smuggler or Hunter from being attacked at long range, forcing your opponents to move closer if they want to target Greedo with an attack. Then, once they do manage to get close enough to attack, you can play Stroke of Brilliance to suddenly boost your blocks and evades, escaping the brunt of the damage with ease. For just a few credits, Greedo is more than willing to fight for your cause, whatever that may be. A few expendable hunters fill out your strike team and give you the figures to launch a powerful strike as soon as battle is joined. 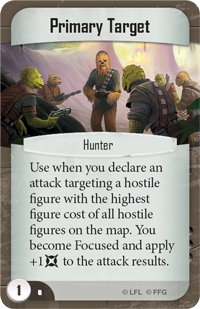 Choose your target and hire your hunters: you can pre-order your copy of the Greedo Villain Pack at your local retailer today! 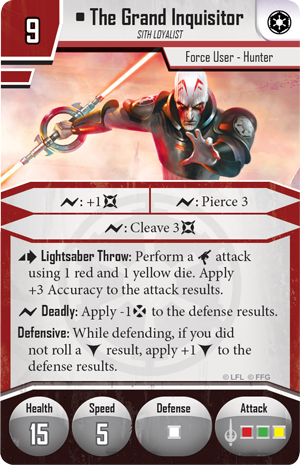 Join us in our next preview as we look at the power of the Force in the Obi-Wan Kenobi Ally Pack.